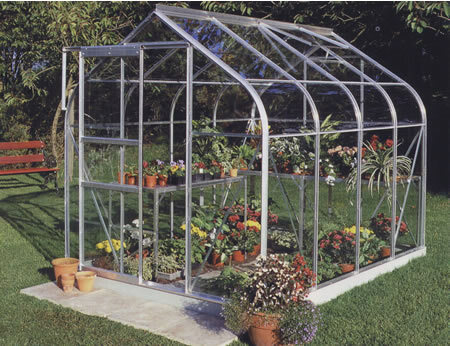 The classic, elegant curved structure of this Supreme Greenhouse will add style to any garden. It has a comfortable ridge, smooth action sliding door with acrylic curved eaves generating additional height for your plants. It has a handy roof vent too, for healthy ventilation. The Supreme aluminium greenhouse measures 3.83 deep x 2.55m wide. 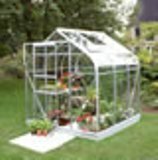 Complete with double sliding door, 4 roof vents, toughened glass this is a treat for keen gardeners. 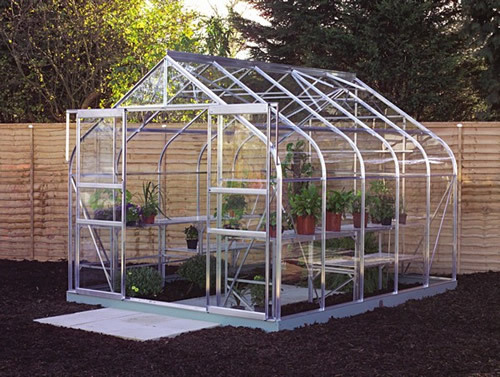 Designed with elegant curved lines this Silver Supreme greenhouse will compliment any garden. The greenhouse measures 4.46m deep x 2.55m wide comes with four roof vents for healthy ventilation. Here is an Aluminium Supreme Greenhouse complete with toughened glass and double sliding door, this is a luxury treat for keen gardeners. It measures 3.20m deep x 2.55m wide. Greenhouse from the Halls Supreme range. Featuring elegant Curved eaves and one roof Vent. 1.33m Deep x 1.93 wide. 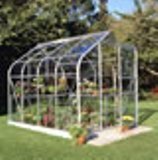 An Aluminium Greenhouse from the Supreme range featuring trade mark curved eaves. 1.93 Wide by 1.95m deep. Aluminium Greenhouse with sliding door and curved eaves 2.57m deep by 1.93 wide.